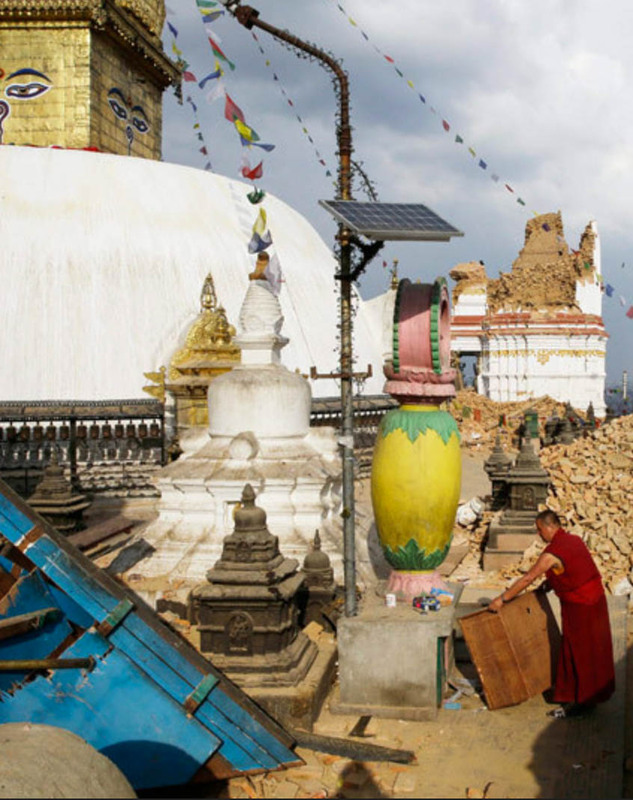 Update: Many of Swayambhu’s structures suffered considerable damage in the earthquake of April 2015. 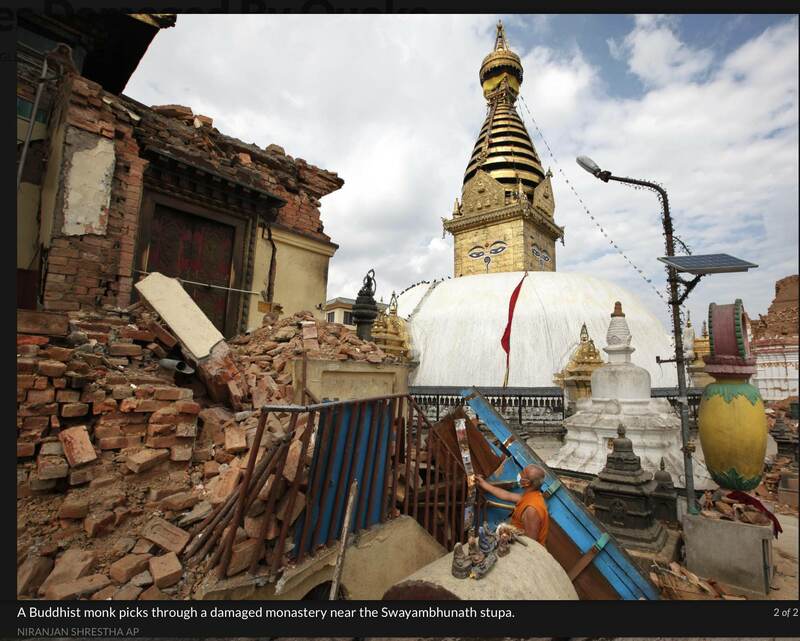 The Anantapura shikhara to the left of the steps toppled and there was serious damage to buildings on the west side of the stupa. See the end of the post for more images and links to video footage. 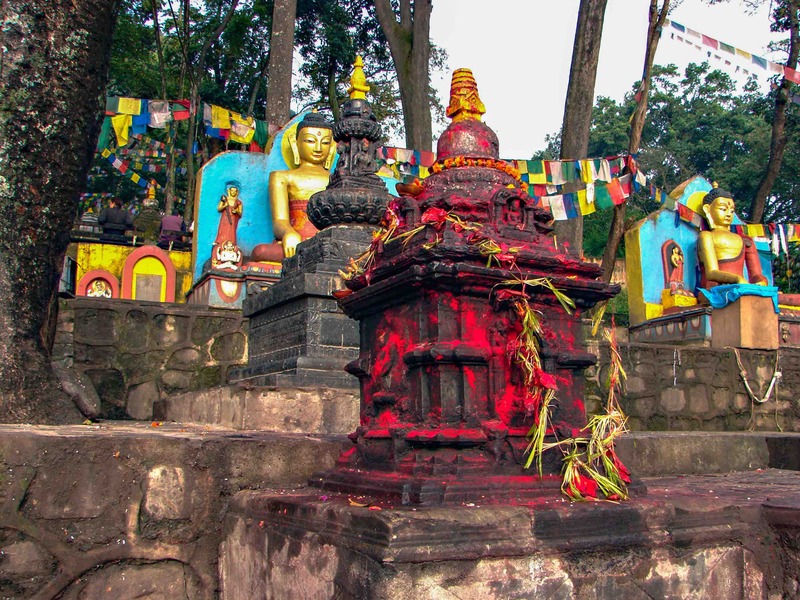 A three kilometer walk from Thamel across the Vishnumati River and you soon come to the foot of a tree-covered hill known as “Swayambhu” (the self-arisen), a site which figures in the very creation story of the Kathmandu Valley. 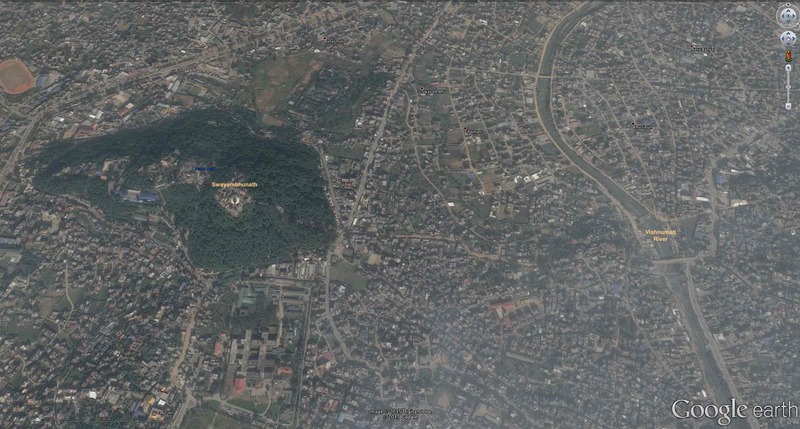 If nearby Boudhanath is the #1 site for Tibetans, then this one was traditionally central to Newari Buddhists. Since the early 1960’s the Tibetan refugee population has embraced it too, as the gompas nearby show. 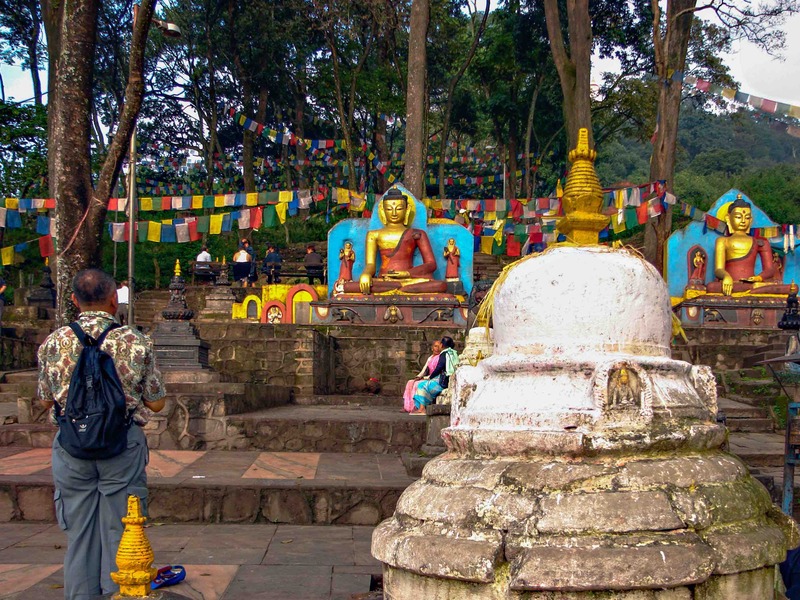 Their origin myth tells of a lake which once filled the entire valley until Manjushi, the bodhisattva of wisdom, paid a visit to worship the lotus he had seen in a dream. Finding the lotus, and wanting to make it easier for pilgrims to reach, he cut a gorge at one end of the lake and thus drained it. 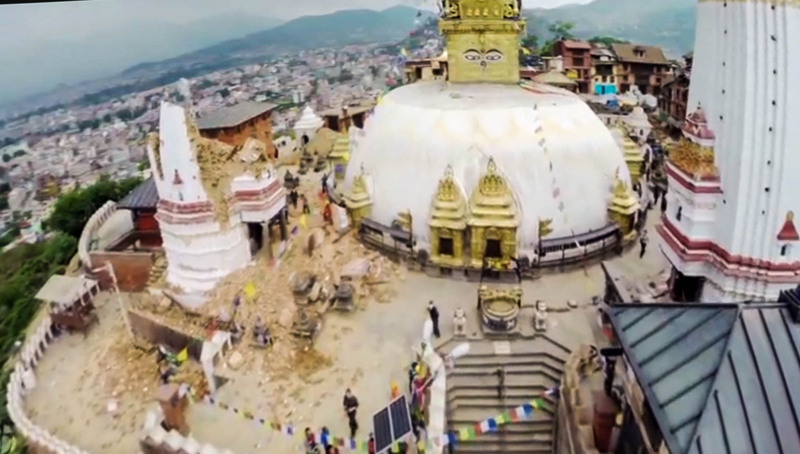 And so the Kathmandu valley came to be – and the spot where the lotus was became the top of the hill we see today. 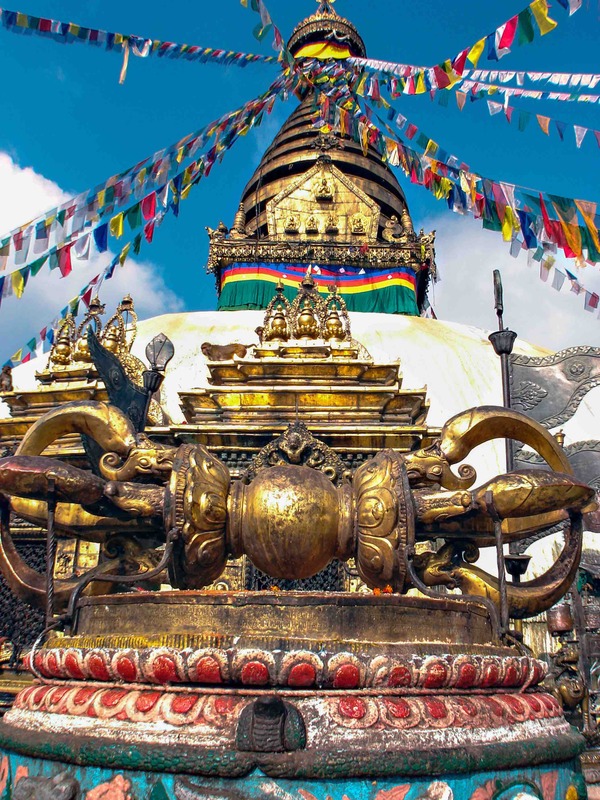 In time a stupa was built where the lotus used to be – and eventually other shrines and temples around it on the hilltop we know as Swayambhu. 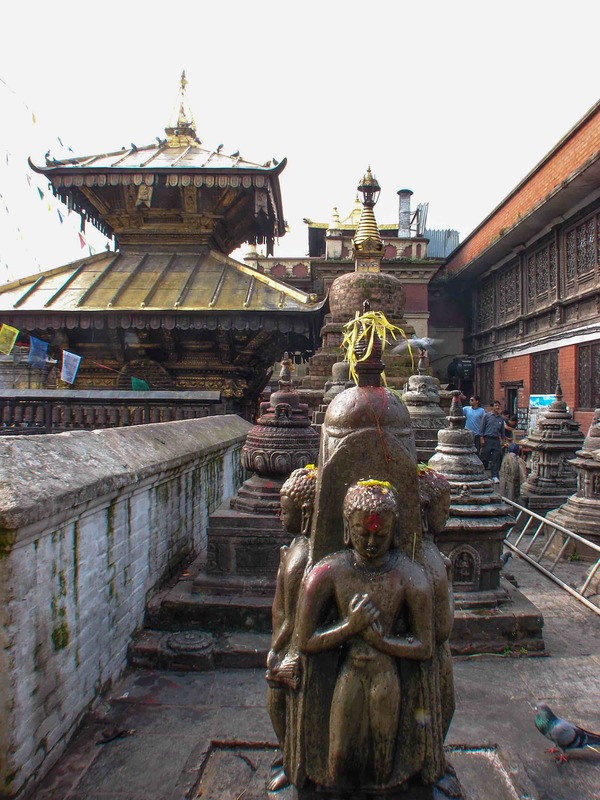 The steps to the top pass by many shrines and statues erected over the centuries by Buddhists keen to earn merit at this holiest of Kathmandu’s sites. 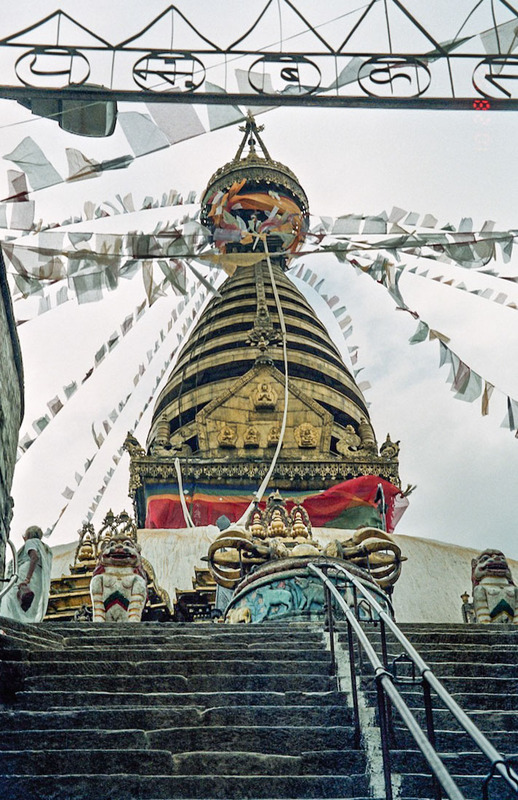 Tibetan prayer flags flutter on the way up – the healing mantras imprinted on them blown into an imperfect world. 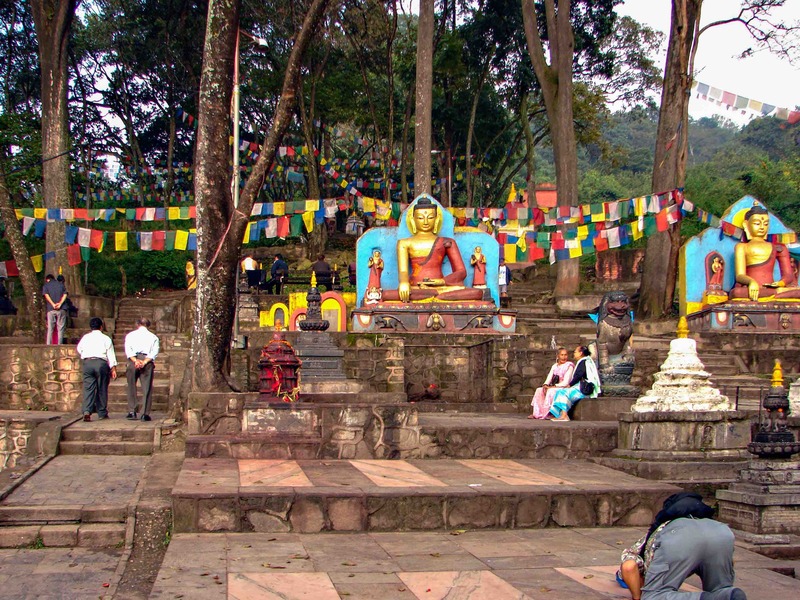 In the pix above and below you see them behind the seated Buddhas, who are in the “touching the earth” mudra associated with the moment under the Bodhi Tree when Siddhartha Gautama became the Buddha, the Awakened One. The pix above and below illustrate the seated Buddha in a mudra named varada. Unlike the Bhumisparsha (touching the earth) mudra, here the palm of the right hand is turned outward and symbolizes the granting of wishes. 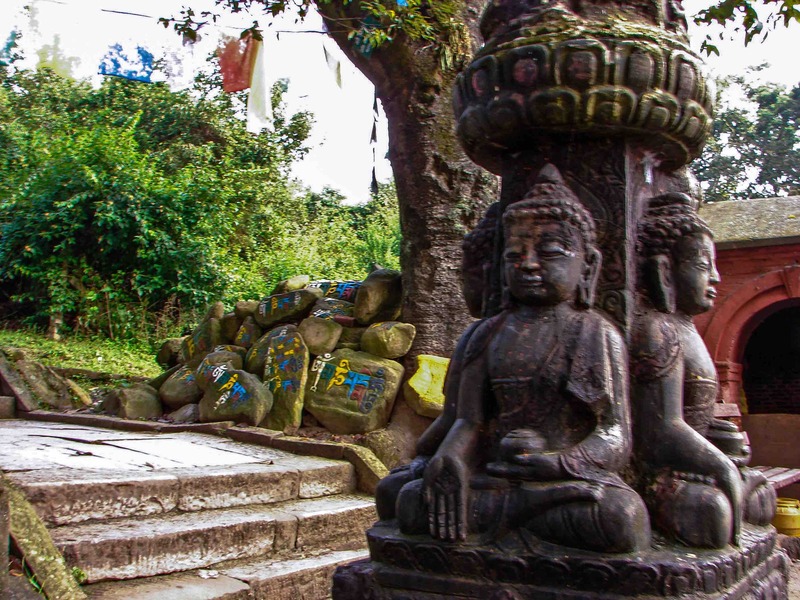 All of the Buddha figures hold a bowl – it contains the medicine or dharma for what ails us – in their left hands. 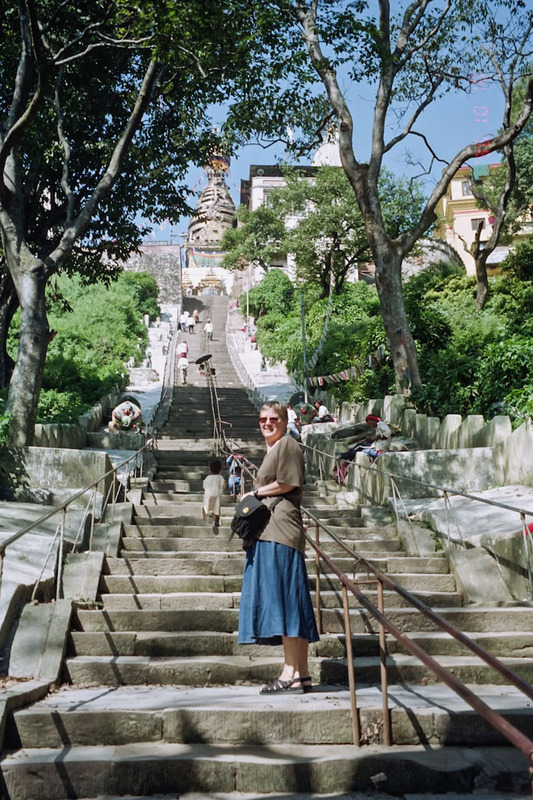 Sometimes as you approach the top you are met by rhesus macaques, who have been known to intimidate a pilgrim or two. 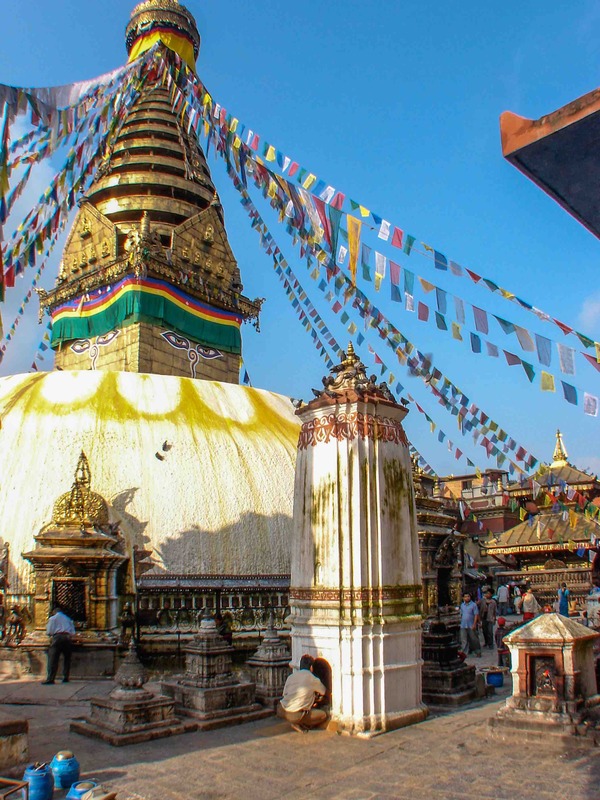 They are more likely to be found on the northwest side of the hill; their very presence here has led some to call Swayambhunath “the Monkey Temple”. You are more likely to encounter them at the end of the day as things cool down and they venture out. 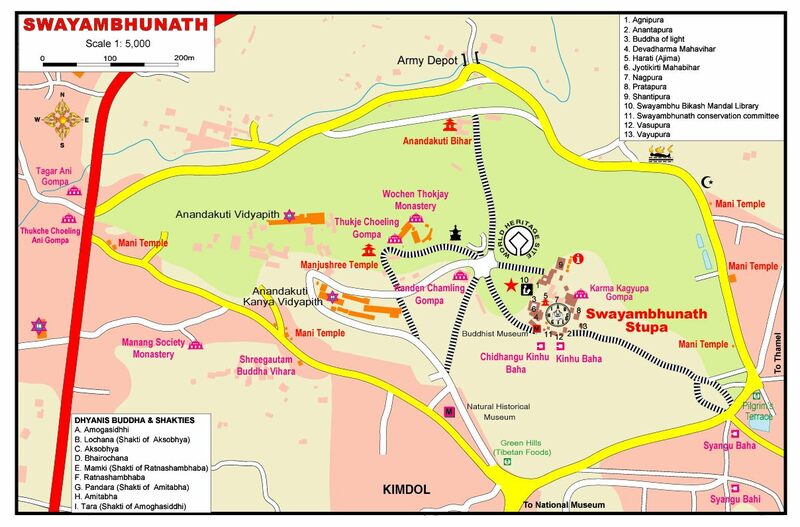 The first thing you see as you approach the top is #9 (map below) the Great Thunderbolt, symbolic of a great spiritual force (the Dharma) which is able to cut though all things. 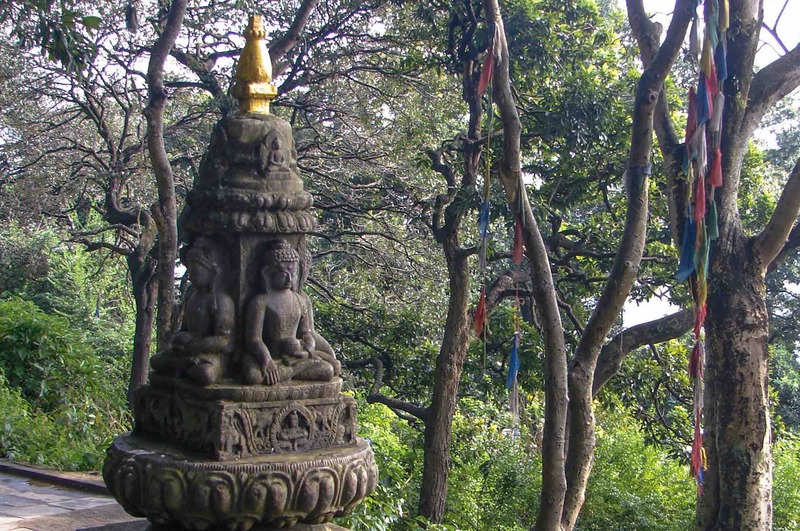 Behind it is #2 – the enclosed shine of Akshobhya, one of the Five Buddhas. 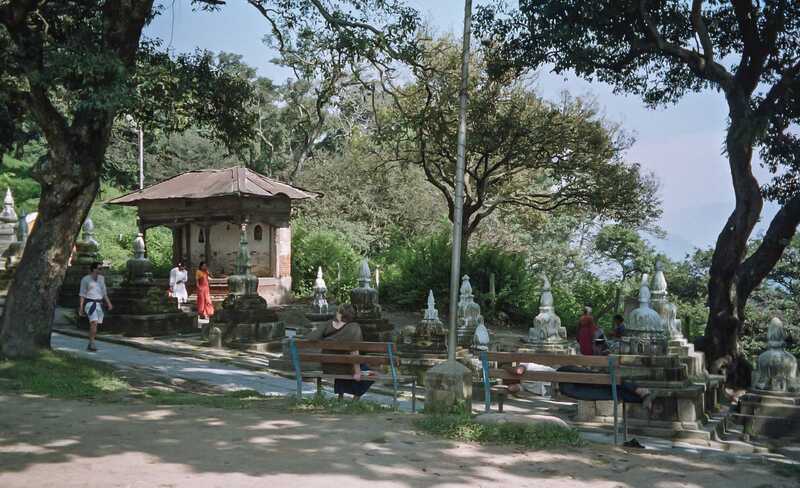 As you walk around the stupa in a clockwise direction, you pass by another three at the various cardinal points. 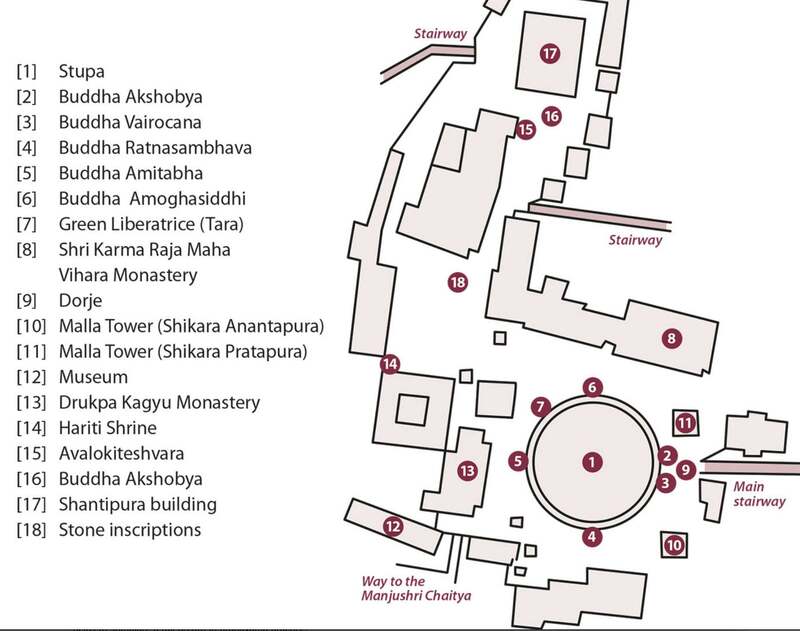 (#s 4,5,6) The fifth Buddha’s shrine (#3), which should symbolically be placed in the centre of the stupa, can be seen in the pic below just to the left of the Akshobhya shrine at the eastern entrance. 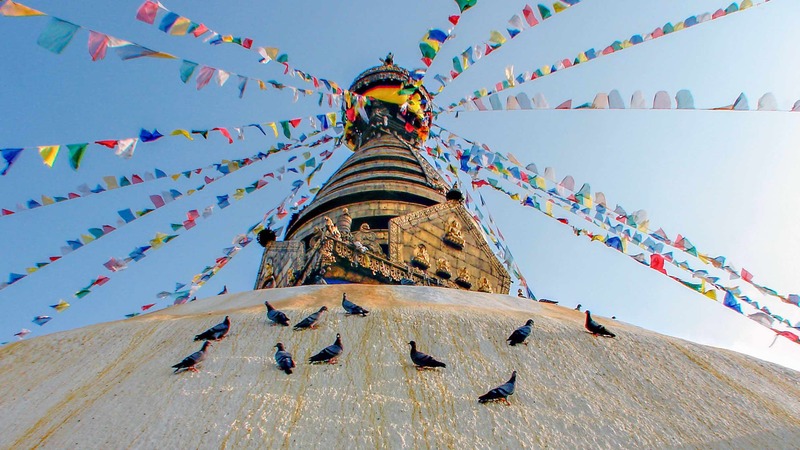 The stupa itself is made up of four main parts: the whitewashed dome, a cube which sits on the top, and a cone with thirteen progressively smaller rings up to the top, and an umbrella. 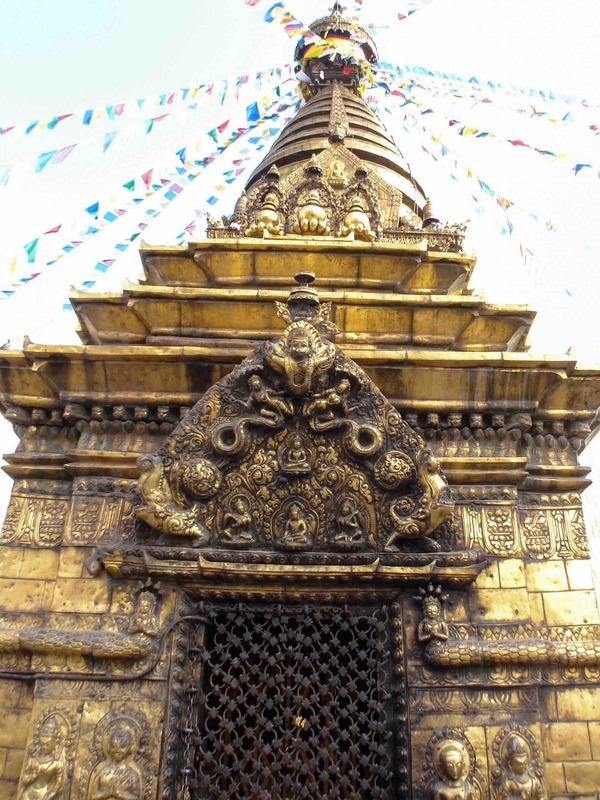 The dome is often splashed with saffron-coloured water; on each of the four vertical sides of the cube or harmika are painted the Buddha’s eyes, as well as ek, the Nepali number 1 (which some take to be the nose!). 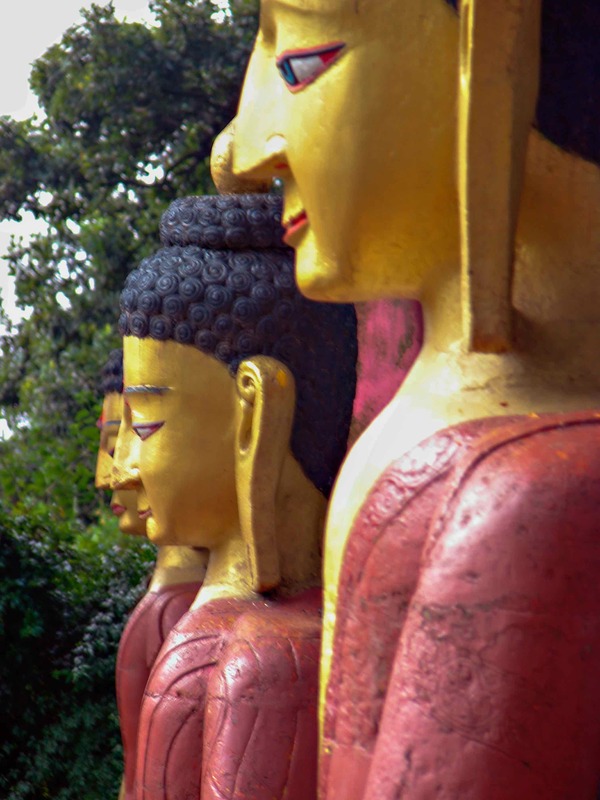 Between the eyes – and just above them – is the urna curl, the tuft of hair which is one of the key marks of a Buddha. It is sometimes interpreted as the Buddha’s third and all-seeing eye. 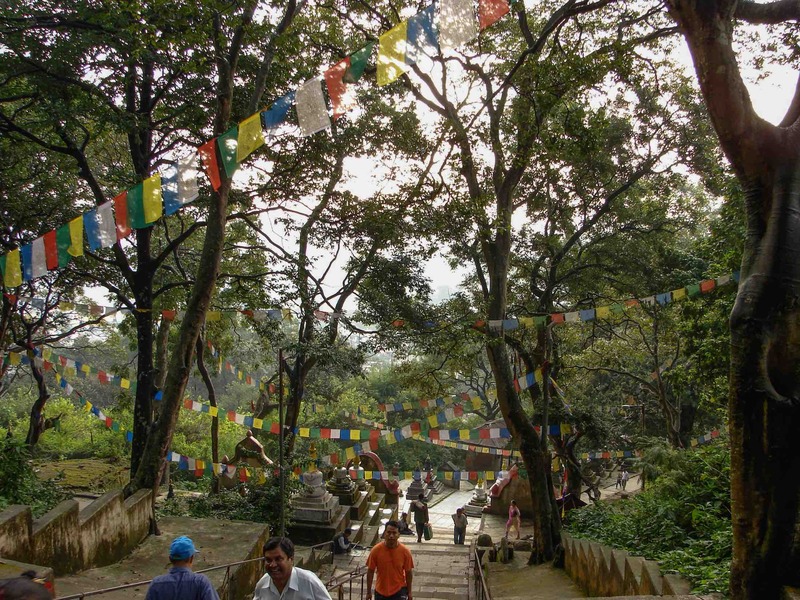 All around the stupa at shoulder height are prayer wheels inscribed with the words “Om Mani padme Hum” (Hail to the Jewel in the Lotus), a petition to Avalokitesvara, the Bodhisattva of Compassion. 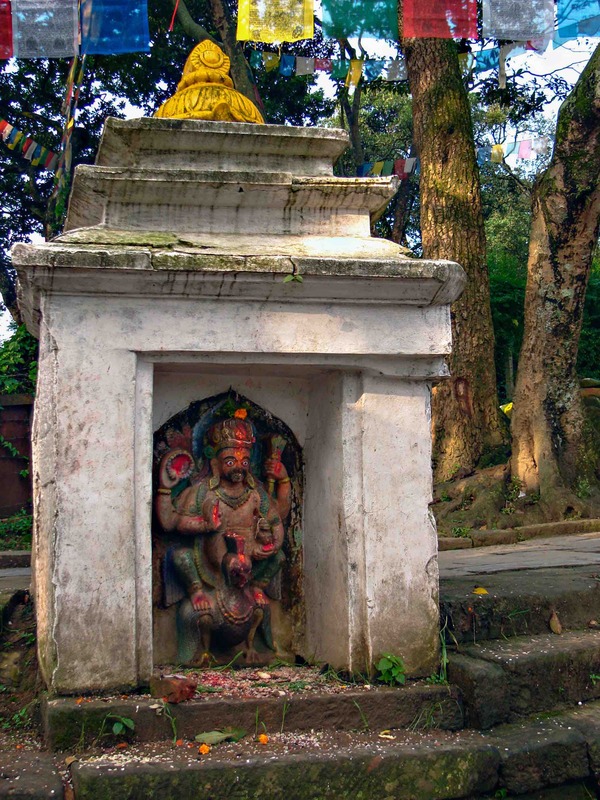 He is known as Chenrezig in Tibetan Buddhism and has the Tara as his female equivalent. Elsewhere this bodhisattva takes on a female form and is known as Guanyin in China and Kannon in Japan. 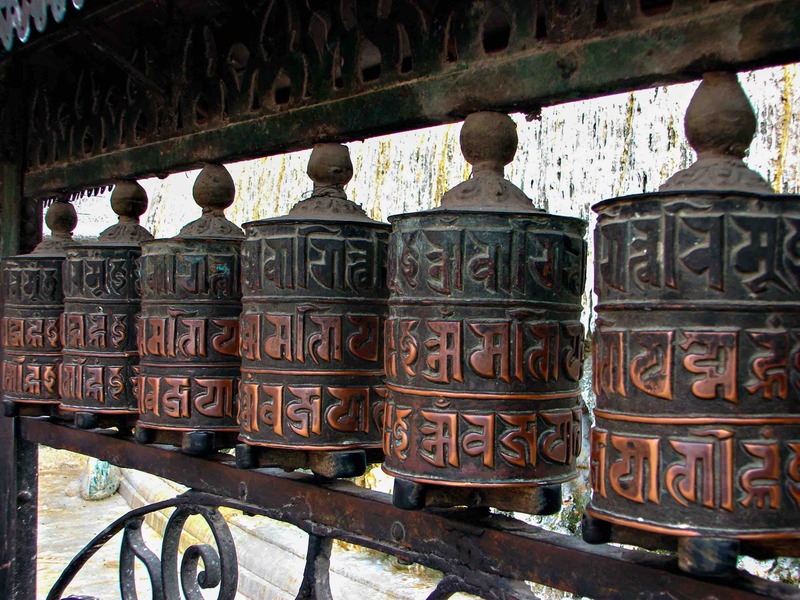 Spin the wheel and release the prayer into the world so that all sentient beings may benefit! The standing Buddha in the pic below is shown in the Abhaya (Have no fear) mudra, with the right hand palms outward; the left hand is in the varada mudra, also seen in a few of the pix above. 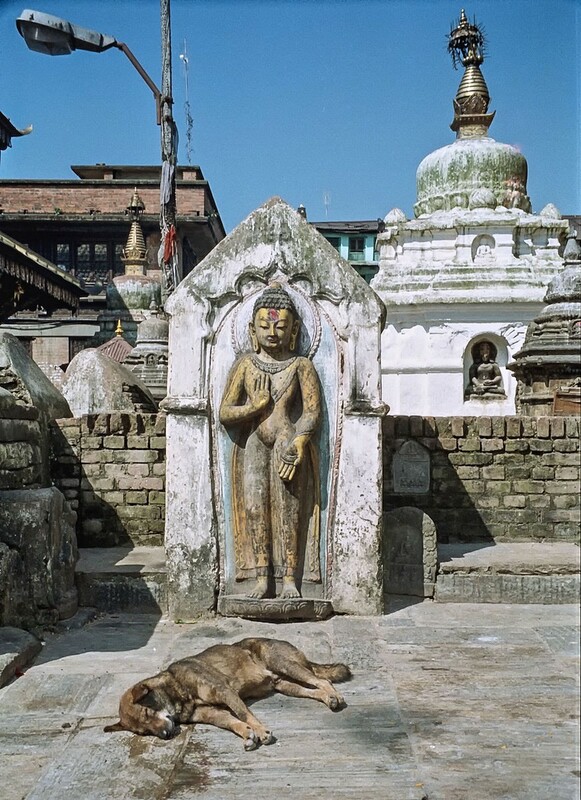 The stray dog may well be a dead dog; on our first visit to Kathmandu in 1996 we were struck by the hundreds of stray dogs roaming Thamel, especially early in the morning before streets really came alive. 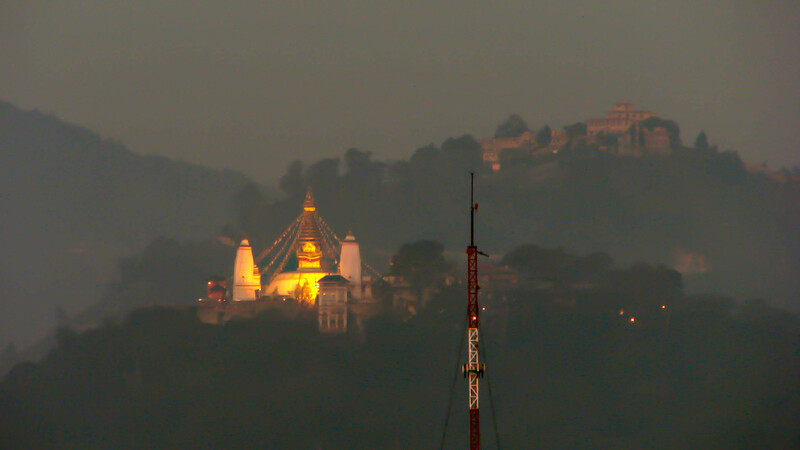 Later that day from the roof top of our hotel in the Thamel area, I pointed my telephoto lens west towards Swayambhu and got this shot of the lit-up stupa and the two slender Malla-era shikharas. 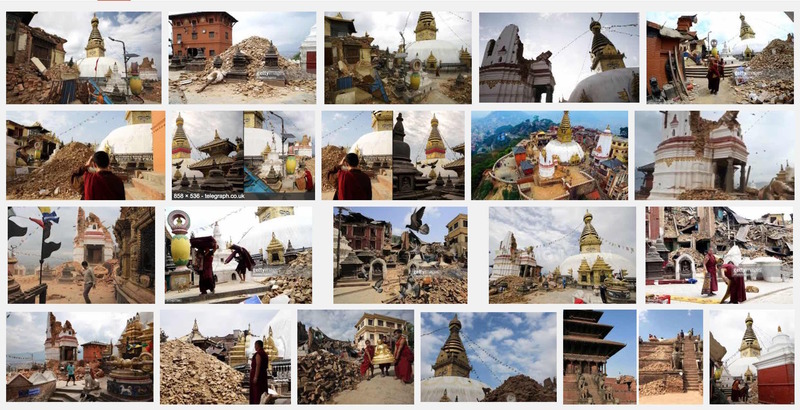 As the images and film footage below show, the earthquake toppled the one on the left. 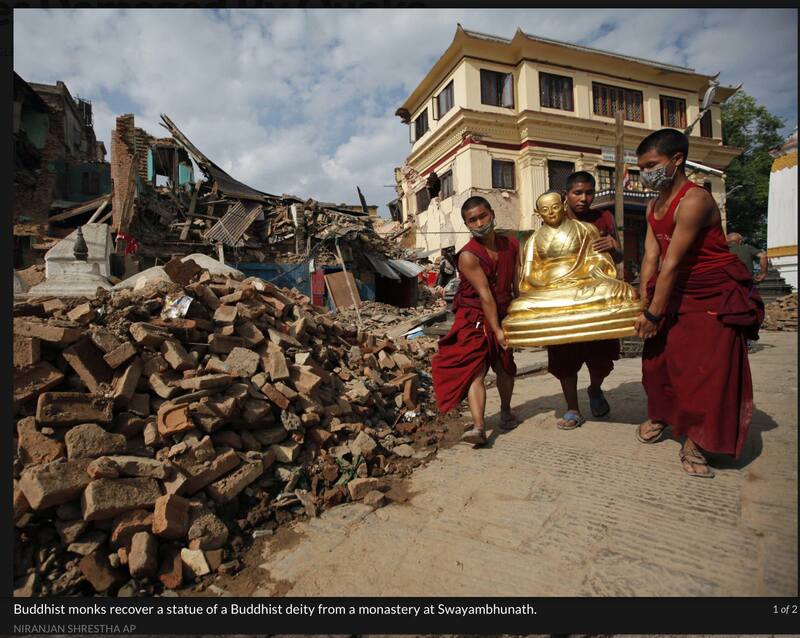 A May 20th video from the New York Times looks at Swayambhu and the fate of the salvaged statues and other objects from the ruins. See here. 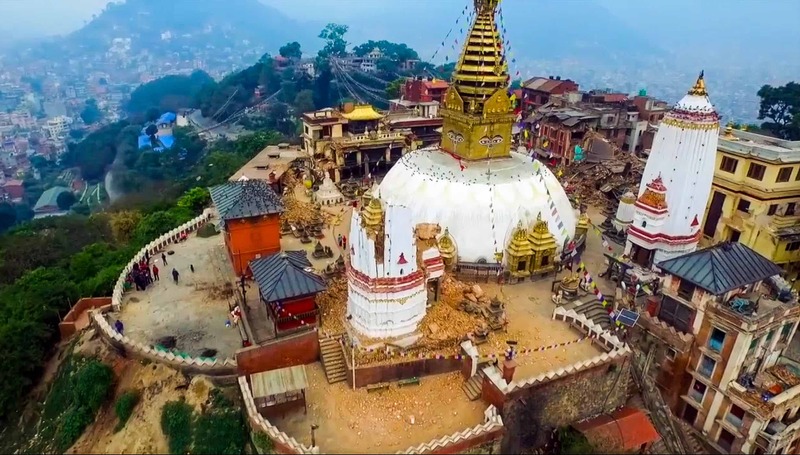 A Canadian Broadcasting Corp News item from May 7 (“Saving Nepal’s Heritage Sites”) has perceptive commentary by Adrienne Arsenault and some video on sites like Swayambhu and Lalitpur (Patan) and Kathmandu’s Durbar Square. 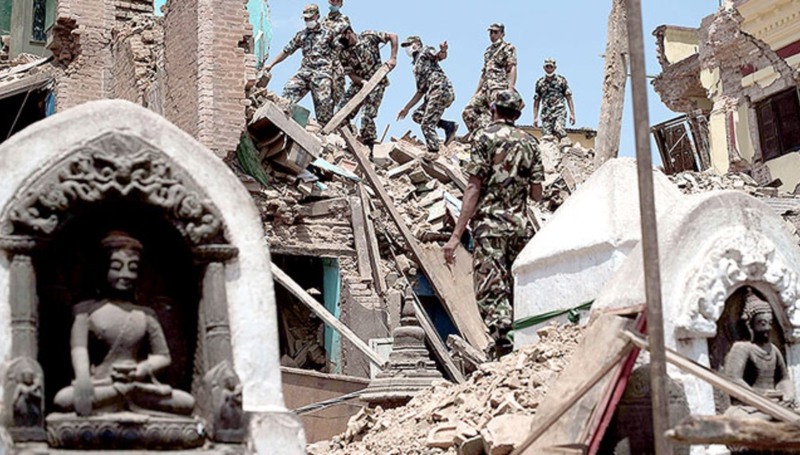 This entry was posted in Nepal and tagged buddha eyes, swayambhu 2015, swayambhu before and after earthquake, swayambhu damage, swayambhu dorje, Swayambhu lotus, swayambhu map, swayambhu prayer wheels, swayambhu satellite map, swayambhu steps to top, swayambhu stupa. Bookmark the permalink. Your best blog ever. I visited this sacred site in the late 1970s, and appreciate your sensitive and articulate description of the site and the aftermath of the Earthquake. Sounds like a worthwhile exhibit at the Ruben. The five- minute interview with Van Alphen was informative and certainly made clear the massive task which lies ahead. 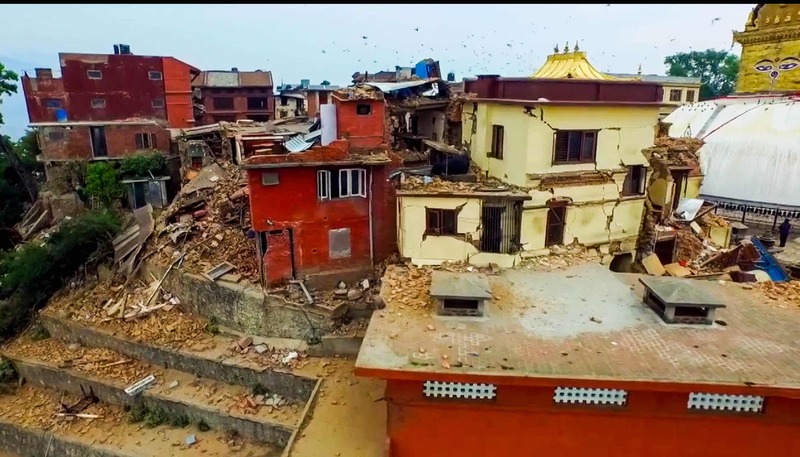 I remember being in Bhaktapur in the mid-1990’s and seeing the signs about German aid money to rebuild some of its structures from the last earthquake. Now it begins again. 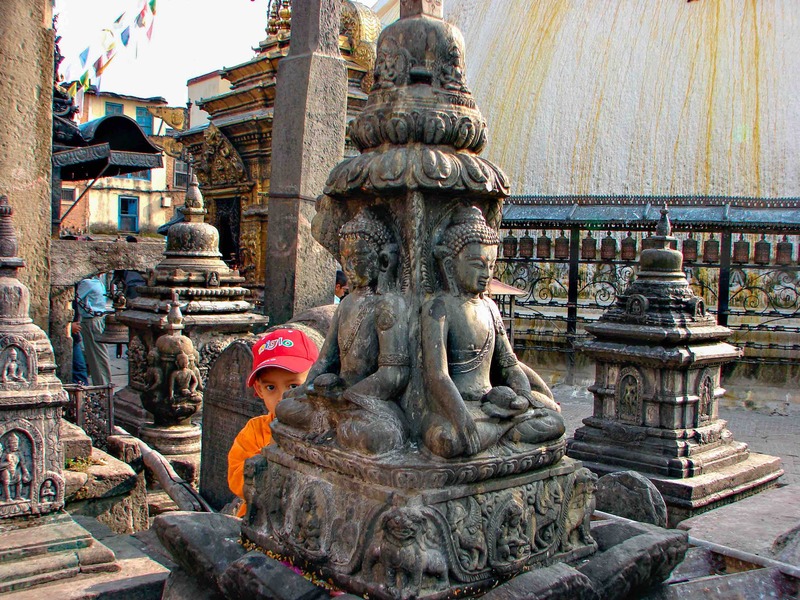 Van Alphen’s emphasis on the unique cultural synthesis which is religious worship in the Kathmandu Valley – the animism, shamanism, Shaivite and Vaishnava Hinduism, and Buddhism- was exactly what I was reading about when your comment arrived! 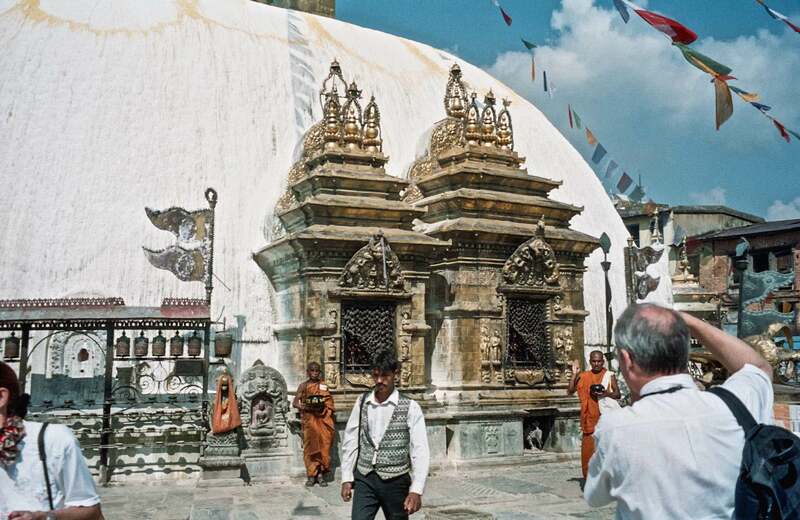 The book is Power Places of Kathmandu with incredible photos and text by Keith Dowman. It has been a decade since I last opened it. Thanks for the links. They’ll provide readers with more background. 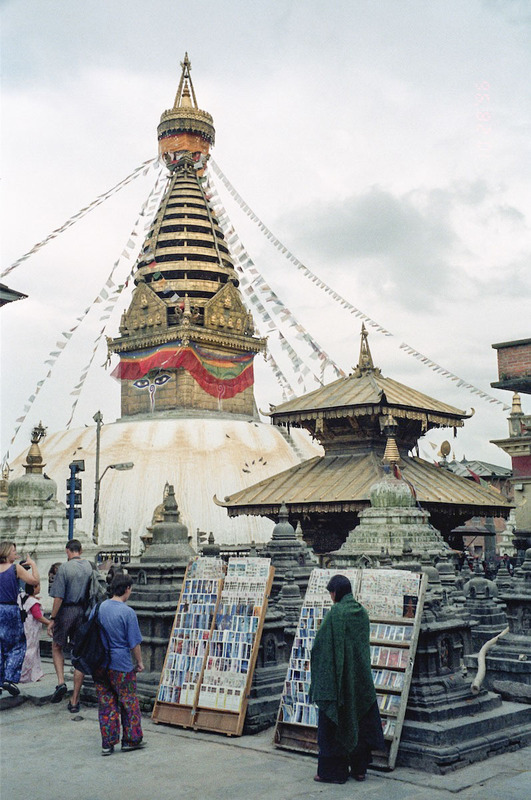 I’ll be spending the weekend with the book and putting together a post on Boudhanath.